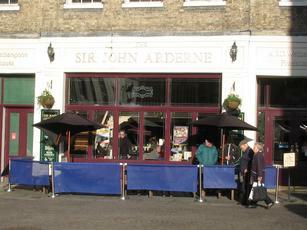 Wetherspoon's can offer the best selection of ales in many towns of this size. But not in Newark. In fact, the selection was quite poor - Greene King Abbot, Ruddles Best, Thornbridge Jaipur, Brewsters Roll In The Hay & Jenning's Cocker Hoop. Ciders left over from the festival were Taunton Cider Company First Press Original & Ashridge Devon Bloom. You'll probably come here if you want cheap prices. It was certainly cheaper and busier than most other pubs. But with that came plenty of dirty tables and glasses strewn everywhere. Typical 'spoons layout, with a few more secluded sections than normal. But don't waste too much time here if visiting Newark, unless you're watching your wallet/purse. Visited with wife as we had arrived in Newark as strangers and didn't know what to expect.One end of bar was taken up by the usual Wetherspoons wobblies.Staff had to tell them to stop using foul language but continued to serve them drinks,even though a couple of them had clearly had too much. We moved to the other endofthe bar but could still here the bad language. Didn't go in again,much nicer pubs close by. Medium to small sized Wetherspoon in attractive corner location building with large clear glass windows overlooking the market square. A visit to the toilet is an adventure - take a map and a mobile in case you can't find your way back! Local ales served. Decent. Mixed bag of customers in this JDW. Can be chaotic with service in here with queuing something certain people don't understand. Decent choice of ales though.